2. You must be a member of the T.B.A. to accumulate points. 3. Total points will decide the T.B.A. 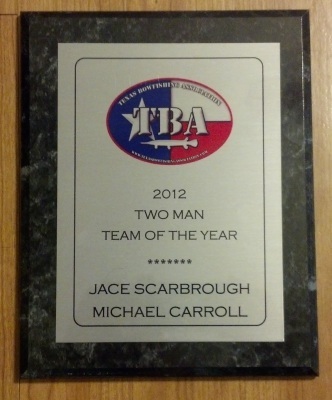 Bowfishing Team of the Year and the T.B.A. Bowfisherman of the Year. Plaques will be awarded to the winners. Bowfisherman of the year (Youth Division) must be under age 16 by the first sanctioned shoot. 4. Each bowfisherman is responsible for turning in his/her own points. Points must be turned into the T.B.A. after each sanctioned tournament. 5. Points will be given to each individual (towards bowfisherman of the year), and to each team, (towards team of the year) based on the amount of teams entered in each tournament. For example, 10 teams at a tournament equals 10 points for first, 9 points for second... 1 point for 10th place. 6. Placing points listed in #5 will be doubled (2x) at the State Championship tournament. 7. 5 points will be given to the team for winning the overall big fish of a sanctioned shoot. 8. Team points must be accumulated with the same partner(s). A. 1-man tournaments will not garner any team points, only individual points. B. 2-man tournaments will garner team points. 1 team created. 1 no show = no team points, individual points only. C. 2 or 3-man tournaments will garner 3-man team points when 3 men are shooting. Two men shooting, same as two- man shoot. 1 man shooting, individual points only. 9. In the event of a points system tie, the State Championship will be the tie breaker. 10. Only your best 5 sanctioned tournaments will count. You can shoot in all sanctioned tournaments.